The South Korean dock landing ship Dokdo participates in anti-submarine drills in early August. Any further North Korean artillery strikes south of the maritime boundary between North and South Korea will be met with shelling from the South, the South’s defense minister said Tuesday. On August 9, North Korea fired more than 100 artillery rounds toward the Northern Limit Line, the sea border between the two Koreas set after the Korean War. Ten of those rounds fell south of the line, according to news reports from South Korea. At that time, the South did not return fire but sent warning messages through military channels to the North. “Under the previous rules of engagement (near the NLL), we’re supposed to send warnings through hotlines and not return fire unless the North fires additional shots,” Defense Minister Kim Tae-young told a parliamentary committee on Tuesday, according to a report from The Korea Times. New rules call for an immediate military response, but still require the North to be warned that the South Korean shelling is coming. "If North Korea fires artillery rounds south of the NLL, we will respond by firing toward north of the NLL," the Yonhap news agency quoted Kim as saying. Tension between the Korean Peninsula neighbors has been heightened since the sinking of a South Korean warship, the Cheonan, in March. South Korea and an international inquiry found a torpedo fired by a North Korea submarine responsible for the sinking, in which 46 South Korean sailors died. The North has denied any role in the loss of the Cheonan. South Korea has since staged military exercises - including anti-submarine drills with U.S. forces - which the North has called a provocation. It was shortly after South Korean naval maneuvers concluded on August 9 that the North fired its artillery barrage. 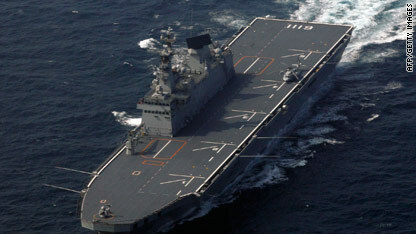 Last Friday, the U.S. military said it will conduct new anti-submarine exercises with South Korea next month. U.S. and EU should cooperate closer in the years to come! We are strong allies, and the only one who can help the world community to maintain peace! People here from Europe must stop pre-judging the U.S. for everything that happens in the world. Europe has forgotten who saved us from Hitler? We need the United States and the U.S. needs the EU in the fight against terror! This could end up in another costly war. We the US should listen to the rest of the world and just pull back to our own borders. Protect them from foriegn invasion, military or otherwise and watch as you all bomb, burn and politically collapse into oblivion. Then when you are all beging at the gates for food and security because you cant handle your own ploitical and natural disasters we will ignore you as you have done to us. Wow seriously Korea? Do we really need to do this all over again? I'm pretty sure that my 70 year old grandpa won't want to go back over there and I don't really want to have to either. Chill out. And when is kim jong ill going to die already? That piece of crap needs to be gone so that hopefully the citizens of NK can get some slack. Wow. S. Korea itself doesn't so much want a war either. In the last 50 years S. Korea has gone from a post-war ravished country, to one that can support it's own people AND help other countries in need. This is a great thing. Now, say tensions escalate and N.Korea/S.Korea go at it. Chances are N.Korea will go down, but not before they get hours/days worth of artillery shelling done. So now, you have a S.Korea that has suffered a lot of infrastructure damage, AND now you have the millions of people in N.Korea that have been impoverished/uneducated/kept in the mud for half a century. This is where S.Korea gets to learn about war reparations. They can't just take away what crap goverment N.Korea had, and leave. They have to help the people up there. Adding 1M plus people to any economy, especially one that now has to support itself after a war, will be crippling. Especially since the majority of people from the North won't have much to offer society after being kept down for years. The US are going to stop doing anything as soon as Kim Jong Ill asks help from China, no one wants to mess with a super power thats eventually going to overtake the USA. Why does it have to be about money or power or political maneuvering, or any of that? The leader of North Korea is a bad guy. We hear about the horrible conditions that people in N. Korea live under, and we hear about what happens when the government there decides that someone from another country is there and not acting like they want. When our kids watch cartoons, Batman doesn't think about the personal consequences of fighting the bad guy, neither does Superman, etc. So why do we? South Korea is our friend and ally. Back when the Korean war was hot, South Koreans died alongside Americans to defend stuff like freedom and democracy there. When we're kids, life is simple. We have dreams and ideas and hopes and all that. Idealistic, even. As we get older, life and practical considerations get in the way. Thats what this discussion is, thats how we justify to ourselves letting stuff like oppression and hunger and mass murders and all kinds of horrible things continue and exist. If I saw my friend getting beat up or harassed by his neighbor, I would do something about it. I don't care if his neighbor has bigger guns than I do, or a tough older brother. The right thing to do is the right thing to do. I'd prefer the consequences of that, rather than having to look in the mirror and know I did nothing.